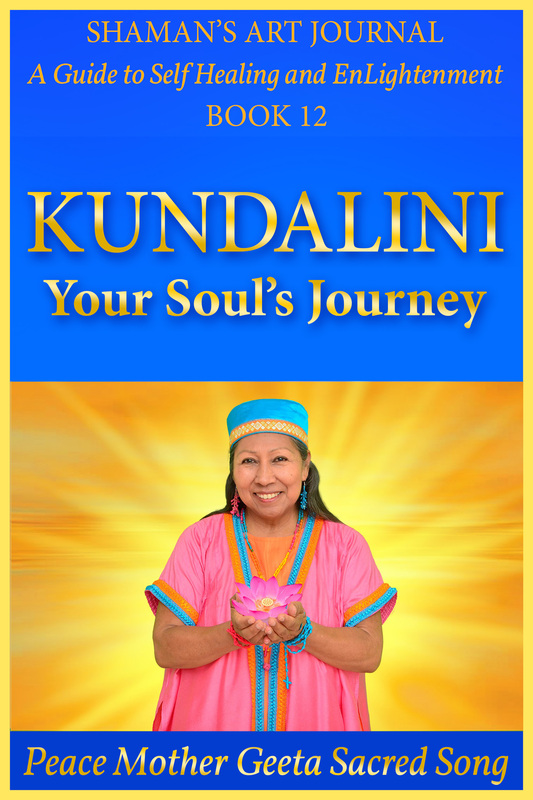 In Kundalini: Your Soul’s Journey, Peace Mother shares Sacred Teachings on Kundalini Shakti, the Energy of the Universe that leads people towards Soul growth, Wisdom and EnLightenment. Along with uplifting Shamanic Teachings, Sacred Mantras and meditation-contemplation practices, a beautiful Light Activation painting is included. Great Spirit channeled this Sacred Artwork through Peace Mother to activate the Light within every cell of your being. Spending time in the company of Peace Mother’s Light Activation paintings accelerates your spiritual expansion so you can experience greater Awareness, Spiritual Knowledge and Self Love. With Wisdom Teachings, Sacred Mantras, the Kundalini: Your Soul’s Journey Light Activation Artwork, and meditation-contemplation practices, Holy Mother provides you practical Sacred Tools and Training to spark a Spiritual Awakening within you. All these Light Activation Tools enhance your understanding of the relationship between the mysterious Creative Power of the Universe and your Soul’s Journey. Peace Mother also illuminates your Soul’s Journey by imparting Teachings on how Kundalini Shakti activates your chakras. Comprehension of how these hubs of Divine Energy-Life Force radiate Light and Life Energy into the body, will quicken your spiritual advancement to help you raise your energy to heal the lower chakras and ascend to the Higher Chakras such as the Heart, Third Eye and Crown Chakra. The Holy Mother’s wise, compassionate guidance provides you easy to implement ways to raise your Kundalini energy, let go of any negative past, and live a more joyous, balanced Life. The exercises and meditations shared heal, strengthen and amplify your chakras to empower you to greater awareness and Self Love.